A new Sydney cruise facility featuring a contemporary roof canopy draped on a historically significant gantry crane structure has won the Harry Seidler Award for Commercial Architecture at the 2014 Australian Institute of Architecture (AIA) National Architecture Awards. The White Bay Cruise Terminal by Johnson Pilton Walker (JPW) involved the adaptive reuse of the sites existing port assets into a brand new cruise facility. JPW have transformed an ageing, unused site into a reinvigorated transport hub. The project fought off stiff competition in the Commercial Architecture category which included the likes of 8 Chifley Square by Lippmann Partnership/Rogers Stirk Harbour & Partners (NSW), Bread in Common by spaceagency (WA) and the Prahran Hotel by Techne Architects (Vic). 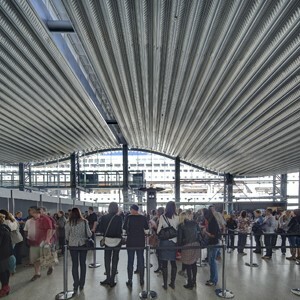 The project was also the recipient of the COLORBOND Award for Steel Architecture, with the terminal’s undulating roof canopy impressing the judges for that category. “The White Bay Cruise Terminal started with a competition. After winning the project, the architect made the bold decision to tell the client they had had second thoughts and would like to propose a new design that retained elements of the 1960s container shed, which covered a large part of the site. Luckily the client had faith and a second scheme was quickly developed. This new scheme had a dramatic new diagram centred on the two giant steel gantry crane beams that had been scheduled for demolition, allowing the project to retain an evocative reminder of Sydney Harbour’s working history. “One strong, single move defines the project – a sinuous steel and aluminium roof suspended between the twin gantry beams in a giant, wave-like form. The plan is orchestrated around this singular move: added to it are a low-scale linear service and amenities block on the land-side gantry, glass enclosing walls on the other three sides and muscular steel passenger embarkation bridges. The interior is bold but refined, a massive clear span disciplined by a limited palette of materials. The roof is supported by suspended steel tubes that are curved to the varying wave profiles. Aramax cladding spans between the ribs, its shape easily accommodating the curvature. The ceiling soffit has perforated Aramax lining, while the interstitial space is lined with thermal insulation and acoustic treatment. Freestanding service bollards supply tempered air and support uplights. The lighting scheme is particularly effective – inside, light shimmers on the multi-faceted surface of the ceiling. “The massive concrete wharf apron, gantries, roof and sandstone cliffs frame the whole project and are of a scale that matches the cruise ships that the terminal serves. Although commissioned by a public authority, the White Bay Cruise Terminal provides a great new venue for commercial events and functions and also delivers a striking facility for Sydney’s burgeoning cruise industry.